Is the September rally over? Investors were acting cautiously Monday as lawmakers in Washington continue to battle over a budget deal. 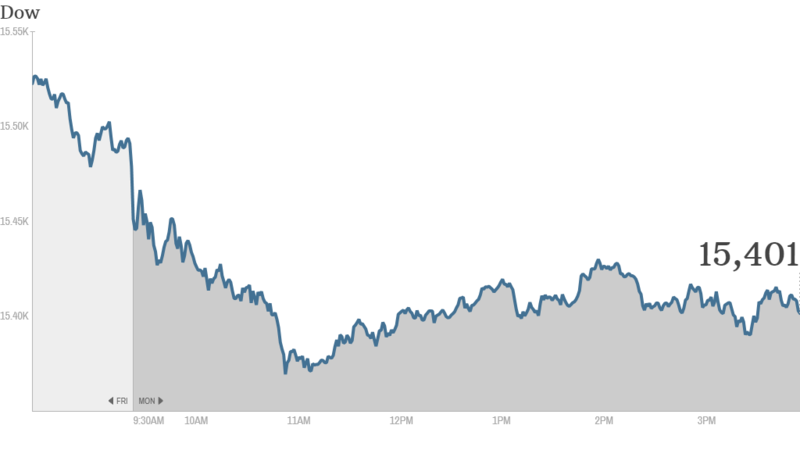 The Dow Jones industrial average, S&P 500 and Nasdaq declined modestly. Unless a compromise is reached during the next week, the government is poised to shut down at the start of October. While investors don't typically worry too much about a shutdown, the political wrangling and gridlock ahead of the budget, as well as the looming debt ceiling deadline may cause some volatility in markets, according to experts. "We suspect a budget showdown in Washington will likely weigh on global markets for the next several weeks," said Craig Johnson, senior technical research strategist at Piper Jaffray. But he added that any weakness in stocks would be a buying opportunity, as he doesn't believe either Democrats or Republicans would let the country default on its debt. The budget fight overshadowed positive global economic news, as new data from HSBC showing China's manufacturing sector expanded at the fastest pace in six months. The Federal Reserve also remained in focus, following last week's decision to hold off on its plans to taper its bond buying program. In a speech Monday, New York Fed President William Dudley said he would "like to see news that makes me more confident that we will see continued improvement in the labor market" before cutting back on the central bank's stimulus program. BlackBerry buyout: BlackBerry (BBRY) announced Monday afternoon that its largest shareholder, Fairfax Financial, was leading a group to acquire the troubled company for $9 a share. After a brief trading halt, shares initially surged 5% to above the $9 takeover price. But the stock quickly trimmed those gains and ended only 1% higher. The $9 price tag is slightly above where shares traded earlier Monday, but below where the stock was Friday just before BlackBerry shocked investors with the news that it would slash 40% of its workforce and also warned of a $1 billion quarterly loss. What's moving: Apple (AAPL) shares jumped after the company said it sold a record 9 million iPhone 5S and iPhone 5C devices worldwide during the first three days the phone went on sale. Apple was the biggest winner in the S&P 500. "$AAPL Maybe $BBRY should put out a Gold model too....," quipped StockTwits user Lach14. Apple also said that 11 million listeners have tuned into iTunes Radio since its launch last week as part of the new iOS 7. Shares of Pandora (P) declined sharply on the news. "$P The problem I see with Pandora is where it can innovate from here," said StockTwits user Duckid. "With such a big wall up I don't see them pulling away iRadio users." Financial stocks were among the worst performers, with shares of Citigroup (C), Goldman Sachs (GS), JPMorgan Chase (JPM) and Bank of America (BAC) down more than 2%. Monday marks the first day that Bank of America, as well as Hewlett-Packard (HPQ) and Alcoa (AA) are no longer included in the Dow. But the newest components weren't helping the Dow's performance. Goldman Sachs was the Dow's biggest laggard, while Nike (NKE) and Visa (V) were down about 1%. 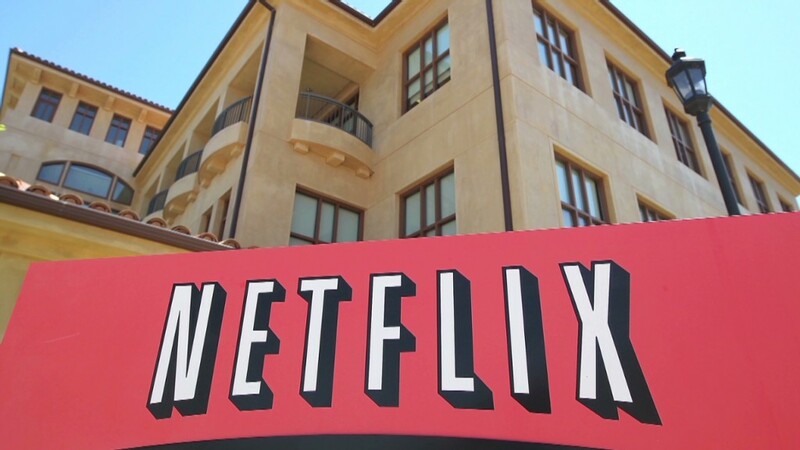 Netflix (NFLX) shares also slid, but only after hitting a record high earlier in the day. On Sunday, director David Fincher won an Emmy Award for his work on Netflix's "House of Cards" series. The Emmy win was the first for a TV show that only airs online. "$NFLX 430% up in 1 year, will give up on some of that gain. Smart money selling...Bearish," said StockTwits trader FreeFall. TradeAssassIn added that "$NFLX Carl [Icahn] has to be selling here." Icahn took a 10% stake in the streaming video company in October. But as recently as two weeks ago, the billionaire investor said he hadn't sold a single share of the company. European markets closed lower, despite German chancellor Angela Merkel's big victory in Sunday's elections. Stocks dipped after eurozone purchasing managers had reported slightly stronger-than-expected growth in manufacturing and services. Asian markets ended mixed. The Shanghai Composite index rose by 1.3%. Hong Kong's Hang Seng index fell after being closed in the morning because of Typhoon Usagi. The Tokyo Stock Exchange was closed for a holiday.